Spokane Night Scenes Posters and enlarged prints were chosen for a long-term display in the lobby of the Spokane Riverfront Park IMAX Theater. Spokane Night Scenes images have been chosen for the 2011 Calendar of the Spokane Regional Clean Air Agency. Photographer John D. Moore, CPP's image, published in the Harold Balaz book, by University of Washington Press. Spokane Night Scenes photographer John D. Moore, CPP is featured on the Online Art Magazine, RiverSpeak. 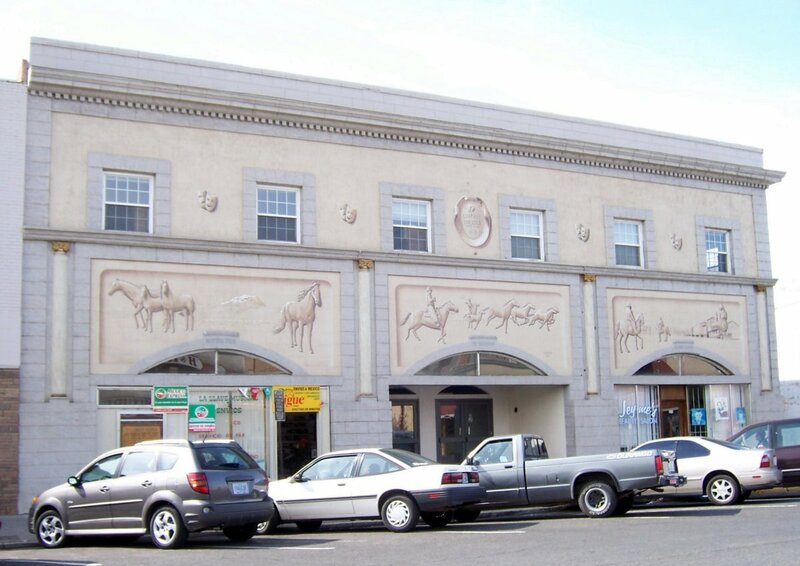 The Hillyard Hobo Newsletter features a series of Spokane Night Scenes, including a 2009 image of Hillyards Alaskan Lounge, on North Market Street. The Spokane Chamber and Spokane EDC (Greater Spokane Inc.) have contracted with Spokane Night Scenes for a cover image for their new 2010 Spokane Relocation Guide. A sample of the 2009 relocation guide is here. Spokane Night Scenes images have been chosen for the 2010 Calendar of the Spokane Regional Clean Air Agency. 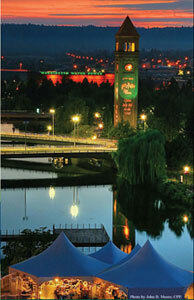 Spokane Night Scenes has been chosen for the image placement on the new Spokane Riverfront Park Map panels. 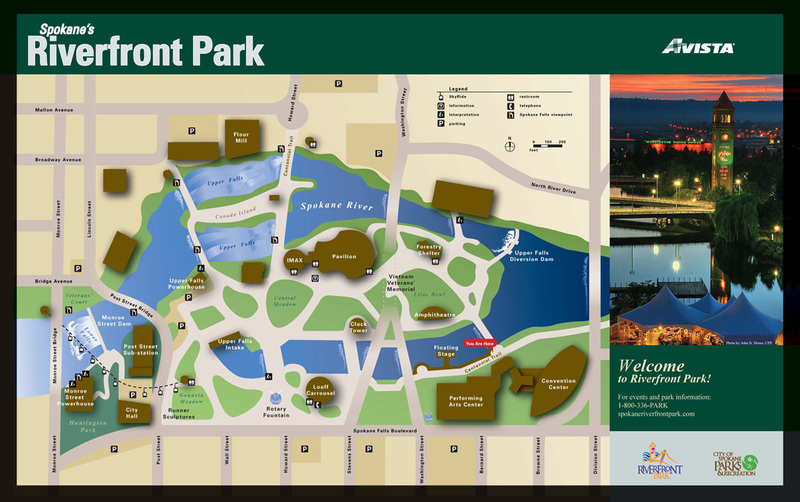 These maps are to be placed at central access areas in Riverfront Park, so that visitors to the park can see where they are and where the activity areas are throughout the park. 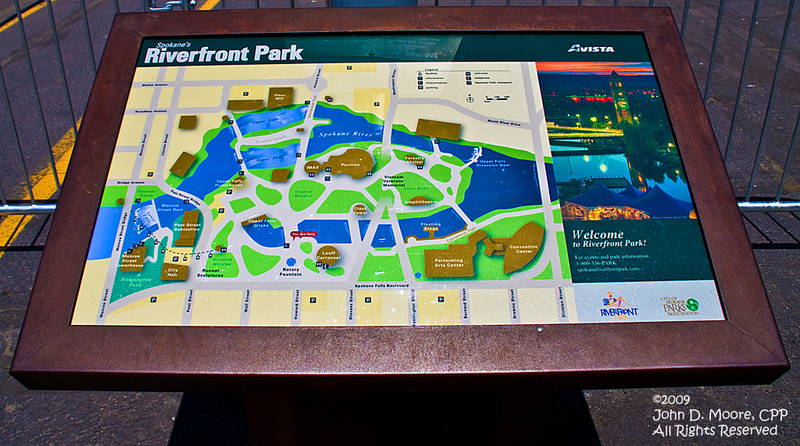 These panels were fabricated and were installed in Riverfront Park at each of the major entrances to the Park. Photo credits were applied directly beneath the image chosen by RFP and Parks . A link to the resized map is located HERE. Spokane Night Scenes displays (Poster sized framed prints), at the historic Liberty Theater. This Gallery display was targeted for the 2009 Memorial day holiday week, at the Liberty Theater, in Toppenish, Washington. Spokane Parks Foundation utilizes Spokane Night Scenes images online. Spokane Parks Foundation is using a select number of images from photographer John D. Moore, CPP. These images are displayed on their website. Spokane Night Scenes images were selected for display, and for promotions related to the 29th National Veterans Wheelchair games to be held in Spokane July 13-18, 2009. So far, magazine editors have chosen these three images for use: Image (1), (2), (3). Promotion for the 2009 National Veterans Wheelchair Games in Spokane has begun, using Spokane Night Scenes images. 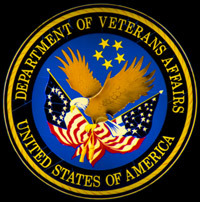 Additional images are to be provided, as needed, by the US Department of Veterans Affairs. "Spokane Night Scenes, an exercise in night photography"
For a READ-ONLY copy of the content for Mr. Moore's updated Spokane night photography workshop, it can be downloaded here. It is an Adobe Acrobat file, about a half MB in size. Low light photography, a short commentary. A short article prepared for low light shooters attending a Spokane Photography seminar sponsored by the Photographic Society of America. The shooters were preparing to shoot the 2010 Lilac Torchlight Parade, in Spokane, Wa. "Tame the light, and you have tamed the Night"
Spokane Night Scenes photographer John D. Moore, CPP has prepared a PDF handout for download from the Spokane Night Scenes Website. The night photography handout was prepared for a Photographic Society of America (PSA) seminar and field trip in May 2010. The City of Spokane, Parks Department will feature Spokane Night Scenes images by photographer John D. Moore, CPP. These images will be featured in the upcoming 2009 Spokane annual report. 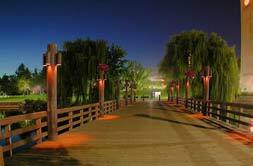 Spokane's Community Minded Enterprises has chosen photography from Spokane Night Scenes photographer John D. Moore, CPP. This use includes their online projects. Spokane Night Scenes is a Corporate Sponsor for Spokane's Unity in the Community event, August 15th 2009. This a event will once again be held in Spokane's Riverfront Park. Stop by the Spokane Night Scenes Booth at this event and say hello! National Geographic featured an image from Spokane Night Scenes photographer, John D. Moore, CPP. The photograph titled "A walk along the narrow path," was presented in the National Geographic Landscape Gallery in May (also June, July, and August) 2008. National Geographic also used the photo as the basis for an online artistic puzzle on the National Geographic website. In the January 2008 issue of Spokurban, Spokane Night Scenes images were featured on the cover, and also internal pages. Editor Jeremy Bolton, has provided a PDF file download of the Spokane Night Scenes related pages. It is a PDF file, and the file size is approximately 10MB. Client Poster Prints are a "BIG" hit! Clients of Spokane Night Scenes are printing extremely large Posters for their projects. Our clients are receiving the digital images they specify, and the file size that they need for their very large poster proects. Poster/Image examples are at this link. John D. Moore, CPP, is a resident of Spokane, Washington. Following a 4 year assignment as a training NCO in the USAF Security Police, he retired from the Spokane Police Department in 1997 after 27 years of Spokane community service. The last 7 years of his Police career included photographing crime scenes, and collisions with serious injuries and fatalities. Photos of assault victims were also taken for evidentiary processes and all his incident photos were available for courtroom presentation to judges and juries. 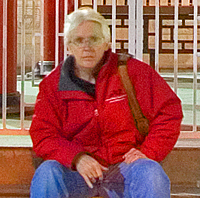 John D. Moore, CPP, owns and operates a Spokane security management firm, and many photos he takes are used in security management technical manuals or online training programs he authors. Mr. Moore spent many years in his police career, admiring the night time beauty of the area he lives in. For him, his ongoing endeavor to shoot a documentary series of Spokane Night Scenes with a digital camera is a most enjoyable change of pace. Photographer John Moore was the first ever trophy recipient of the "John Hill Digital Image of the Year Award," from the Spokane Camera Club. John is the Photography coordinator for Inland Northwest Honor Flight, and coordinator for the National Trust for Historic Preservation photography project. Spokane Night Scenes is a continuing documentary series using digital camera images of Spokane after dark. Based on your requests, our documentary images are now available for ordering and use. Mother nature provided some totally dark outdoor nights as well as heat, ice, snow, and well below freezing temperatures. The rain, fog, and cold winds were all part of the experience in looking at things in a variety of conditions. Nonetheless, taking photos of Spokane night scenes was fun and I hope you enjoy the present and future images of Spokane after dark. All the images displayed here are copyrighted (�2001- 2012 by John D. Moore, CPP). "Commercial use of any individual image or any portion of our digital photographs requires a contract and/or a licensing agreement. Commercial agreements/releases for image use are generally subect to renewal one year following the initiation of each separate or individual agreement." Please download our email transferable release request/proposal form (PDF)."